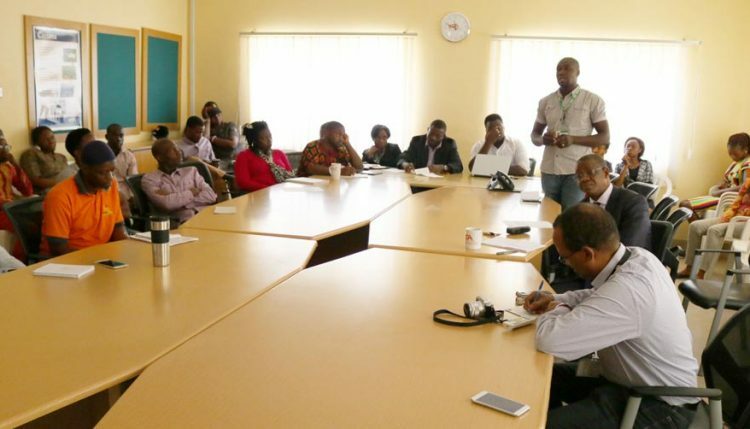 The yam program at the IITA Station in Abuja organized a series of seminar presentations by scientists from the station to educate staff on the progress made in yam research over the years, as well as providing an interactive platform for information exchange. The event was attended by all staff from the station. Staff listen to presentations on IITA’s yam R4D work. Beatrice Aighewi, Yam Seed System Specialist, presented an overview on the breakthroughs in rapid multiplication of yam under the YIIFSWA project as well as progress of the CAY-Seed project, which aims at improving the quality and availability of farmer-saved seed yam. She emphasized the sociocultural significance of yam, with an economic value which exceeds the top four food crops in Nigeria. However, yam production is faced with many limitations including slow multiplication rates, but the YIIFSWA project has been able to break the jinx by developing techniques to greatly increase the multiplication rates such as the Temporary Immersion Bioreactor System (TIBS) and aeroponics system, which have already been established in Nigeria and Ghana. Aighewi further noted that the YIIFSWA project and its partners including the National Agricultural Seed Council (NASC) have established a formal seed system through which private sector businesses can produce and sell certified seed yam to farmers. “To increase productivity, it is essential to have sufficient quantities of certified clean seeds for farmers as it has been proven that yields from clean seeds far exceed yields from seed infected with viruses and other diseases,” she said. YIIFSWA is now on its second phase and there is a provision to train seed private sector companies to solve the problem of seed availability. Further presentations were made by Patrick Adebola and Asrat Amele, Project Leader and Yam Breeder, respectively, of the AfricaYam project. Adebola gave an overview of the project, which is on its third year of implementation. AfricaYam has constructed four yam barns, one each in Nigeria, Ghana, Benin, and Côte d’Ivoire, as well as seven screen houses to support the yam breeding infrastructure in the four target countries of the project. The project has also equipped the national agriculture research systems across the four countries with modern laboratory equipment and digital data capturing devices to build staff capacity especially of young yam breeders. Apart from working with yam breeders from the four West African countries, the project also has partners in the United Kingdom, France, Japan, and the USA to develop molecular tools to support yam breeders. Adebola noted that the project had already established an online forum called the Yam Community of Practice (YCoP) to enable interaction among the diverse stakeholders working on yam. The forum is accessible through the project website www.africayam.org. The final presentation delivered by Amele was titled “Yam breeding for food security and wealth creation”. The presentation emphasized the yield gap, which is the difference between farmers’ actual yield of 10-15 t/ha and the potential yield of 40 t/ha. To bridge the yield gap, improvements in agronomic practices and genomics are essential to speed up seedling and clonal selection decisions by yam breeders. Olurotimi Famodile, AfricaYam Project Administrator, led the interactive session and encouraged the Youth Agripreneurs to take advantage of the huge business potentials in seed yam production as well as yam processing. Comments and discussions on the presentations focused on the need to strengthen capacities to develop future yam scientists, inclusion of yam in the national agricultural strategy of Nigeria to portray the importance of the crop in income generation and food security, the impacts of climate change on yam production, as well as the need for the development of yam specific fertilizers. There was expressed concern over the high cost of processed yam products. Other areas of the yam value chain that need attention are mechanization in yam production, making available clean planting materials of improved varieties, and improved agronomic practices. Solutions to these will help bridge the yield gap and translate to increased productivity and income for yam farmers. An exhibition of yam composite products including yam cakes, cookies, bread, pancakes, and several local dishes prepared from yam were made available for participants to taste. All the preparations were highly appreciated. Participants comments include: “I never knew yam flour can be used for baking”, “It tastes really good”. Many were convinced that yam is indeed a valuable crop and the king of crops, and an important source of food and income in Nigeria.